A foul-mouthed thug abused police during an incident at his flat before he was arrested and went on to trash his custody cell. 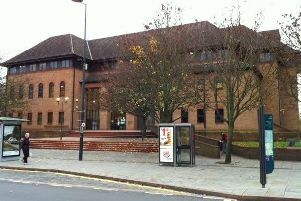 Chesterfield magistrates’ court heard on Tuesday, September 5, how Dene Michael Evans, 38, of Station Road, Old Whittington, Chesterfield, arrived at his home after police had been called due to concerns for an individual’s safety but he had to be arrested for using threatening behaviour. Mr Matkin added that two men were present at the property and one had to be assisted by police as Evans returned home and he became abusive to the two men and made threats and he had to be arrested by police. While in custody, according to Mr Matkin, Evans placed bedding down a toilet and urinated in the cell. Evans told police that he had started shouting at his home because his door had been forced open and he admitted he was wound-up which is why he went on to flood his custody cell. The defendant, who has previous convictions, pleaded guilty to using threatening behaviour and causing damage after the incident on August 18. Defence solicitor Serena Simpson said Evans had come home after a night-out to find his flat door had been put through and he did not understand why it had happened. She added that Evans has previously allowed people to stay at his home but they were causing trouble. Evans said he is remorseful and ashamed of what he did, according to Ms Simpson. Ms Simpson added that Evans has overcome a heroin addiction and is keen to get work and support his family. Evans was sentenced to a 12 month community order with an alcohol treatment programme and a Rehabilitation Activity Requirement. He was also fined £50 and ordered to pay £65 compensation and an £85 victim surcharge.